The Peterbilt 579 near Eau Claire WI brings efficiency and versatile performance to the on-highway market. Peterbilt has designed the Model 579 to maximize aerodynamics and efficiency. Everything starts with the truck’s lightweight and aerodynamic body that cuts through the air. Pairing this design with the truck’s efficient engine options make the Model 579 the most-efficient Class 8 model on the roads today. 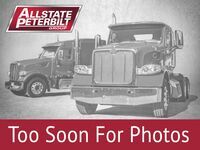 The Peterbilt Model 579 can be found at many of our Allstate Peterbilt Group locations. This includes several locations near Eau Claire and throughout the rest of Wisconsin and the rest of the Midwest. Our inventory includes several Peterbilt on-highway trucks and vocational units, as well as an impressive selection of pre-owned truck models. The performance of the Peterbilt 579 starts with the engine options offered on the truck. The Model 579 can be equipped with PACCAR’s MX-13 engine. This versatile engine can be configured for several different output options. Performance numbers go up to 500 horsepower and 1,850 pound-feet of torque. The Model 579 can also be equipped with other engine options, including the Cummins ISX12 and ISX15. It takes more than just a powerful engine to endure a truck like the Peterbilt Model 579 to drivers. The interior of the truck is spacious and offers an impressive collection of features and systems that keep drivers as comfortable as possible while on the roads. While the cabin is spacious, everything is kept within easy reach of the driver. The dash has been designed to last, and offers a long-lasting finish resistant to scratching and fading. One of the noteworthy features offered on the Model 579 is Peterbilt’s SmartNav multipurpose infotainment system. SmartNav functions as both an information and navigation display as well as providing access to several entertainment features. SmartNav utilizes a special Garmin navigation system and also offer with Bluetooth connectivity, voice recognition, satellite radio and MP3, USB and iPod connectivity. Helping you feel at home in on the roads are the Peterbilt Model 579 offers multiple sleeper options. Available lengths include 44 inches, 72 inches and 80 inches. The sleeper includes multiple storage nooks and cubbies and a TV mount that can hold up to a 82-inch TV.